Here’s the “I killed it” audio. Poor Charlie Brown. Urban Outfitters actually sells a “Charlie Brown Pathetic Tree” which looks exactly like that tree, right down to being tipped over by a christmas ornament. But it’s sold out! We love that sorry little tree. My accomplishments yesterday: I went to the gym, and back out to Brooklyn for the fire incident report, and I’m down to one last Christmas gift to get. No work on the Duke book, but that I will get to today. It’s the home stretch for the holidays. Oh! My friend Cricket sent me Paine’s Balsam Fir Incense. I lit one and I swear it’s like taking happy drugs, having that scent in my apartment. Thank you, Cricket! 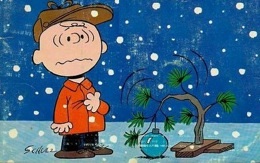 I love that little tree – Every year I want a Charlie Brown tree but get voted down by the family – I always feel bad for the sad looking trees because that won’t have a home for Christmas. Just like after Halloween and all the unpicked pumpkins. Oh well maybe next year I will win! Awwww! Next year get both kinds!